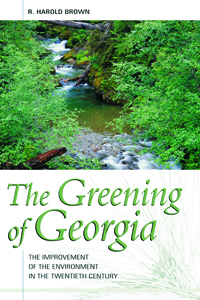 In The Greening of Georgia: The Improvement of the Environment in the Twentieth Century, agricultural scientist R. Harold Brown argues that while there is much left to do in environmental preservation, Georgia's environment is better than any time in the previous 100 years, despite the industrial and residential developement and a near quadrupling of the population at the end of the twentieth century. Since the 1940s, topsoil erosion has been reduced to a minor problem, forests now cover at least three million more acres, and wetlands appear nearly as extensive as in colonial days. Industrial growth increased pollution of streams, but dumping of untreated waste has been stopped, water-related human diseases have virtually disappeared, and fish have returned. Atlanta's air is clearer than at mid-century when there were four times the concentration of particles and sulfur dioxide. No air pollutant is higher than in the 1970s and most are much lower. Georgia's water and air are the cleanest they have been in fifty years. Wildlife is more plentiful and diverse; the white-tail deer population has increased to nuisance levels, new species of songbirds have moved into the state, and the bluebird population has increased nearly five percent each year since 1966.